We've all been there before: you're cooped up in a hotel room in Charlotte, you have a meeting that's running through lunch, it's a rainy day and you don't want to leave the house, or you're just too tired to cook, so it's a vending machine meal, leftovers, or something you didn't even really want. If you're in Charlotte, you don't have to have a boring meal though, and just because you can't get out doesn't mean you can't feast on our city's best food. Charlotte food delivery services can bring a luxurious meal from the trendy spot Uptown, or a couple of burgers from the fast food place on the corner -- it's entirely up to you! There are several restaurant delivery services in Charlotte that will bring you a meal from almost any restaurant in the city for a small delivery fee. Note that the delivery fee for these services do not include your driver's tip. It's always encouraged to tip for good service. Be warned that these delivery services often can take a while. When you have to get a driver to a restaurant, place a to go order, wait for that order, then drive back, wait times often exceed an hour (especially if you're ordering during a lunch or dinner rush, or you're ordering from multiple restaurants). So if you're in a hurry, you probably want to venture out on your own. If you want to try some of Charlotte's best restaurants from the comfort of your home or hotel room, here's a look at the best food delivery services in Charlotte. Hours: For Charlotte, Foodie Call's hours are Sunday to Thursday 11 a.m. to 9:30 p.m. and Friday and Saturday 11 a.m. to 10 p.m.
Foodie Call is probably Charlotte's most popular (and definitely best named) food delivery service. Unlike the other places on this list, Foodie Call has the advantage of being a Charlotte based company. They're not a mega-corporation that's expanded their offerings to Charlotte. The other places will still get food to you just the same, but it's always nice to support the local guys, and Foodie Call has the most expansive menu options in Charlotte. Foodie Call does offer gift certificates. Foodie Call has a list of about 100 Charlotte restaurants they'll deliver from, including favorites like Pinky's Westside Grill, Nan and Byron's, Cowbell Burger and Bar, Taco Mac, Mert's Heart & Soul, 5 Church, Crave, and Rudy's Italian. For a customer service question, for Foodie Call in Charlotte, call 704-245-6575 or e-mail CustomerService@MakeAFoodieCall.com. Find the full list of Foodie Call delivery options in Charlotte here. IDoorDash was founded in 2013 in San Francisco, and quickly expanded to Los Angeles, Boston, Chicago, and other markets (including Charlotte). DoorDash delivers food from plenty of Charlotte favorites like JJ's Red Hotes, Intermezzo, 131 Main, Mac's Speed Shop, Tupelo Honey Cafe, and Viva Chicken. Their delivery options are pretty expansive, with more being added constantly. For a delivery problem with DoorDash, use their "delivery help" section on their website. If you're interested in being a restaurant food delivery driver for DoorDash in Charlotte, you can find their application here. Postmates was founded in 2011, and has been called the Uber of food delivery thanks to their system of using mobile phones to dispatch drivers and receive orders. Postmates currently operates in over 20 states, and in most major cities. In North Carolina, they're also available in Raleigh. The Postmates app lets customers search for their food by category, track delivery (see when their driver is at the restaurant, when their order has been placed, and when their food is on the way), and even send food as a gift. Postmates is the only delivery service on this list that promises to be available 24 hours a day. Other food delivery services in Charlotte usually stop about 11 p.m., but Posmates rolls all night long. In Charlotte, Postmates boasts a delivery catalog of about 50 places: restaurants like Smashburger, Eddie's Place, Bojangle's, Showmars, Chick-Fil-A, and Common Market. You'll also find favorites like Krispy Kreme and Starbucks. Postmates will even deliver from some retail stores (Office Depot, American Apparel, Lowe's, Walgreens, and Trader Joes). Find the full list of Postmates delivery options in Charlotte here. If you're interested in applying to drive for Postmates in Charlotte, click here for their application. GrubHub is headquartered in Chicago, and processes about 250,000 orders every day across the county. It is of the most well known food delivery services, but their presence in Charlotte is a little smaller than most other services. 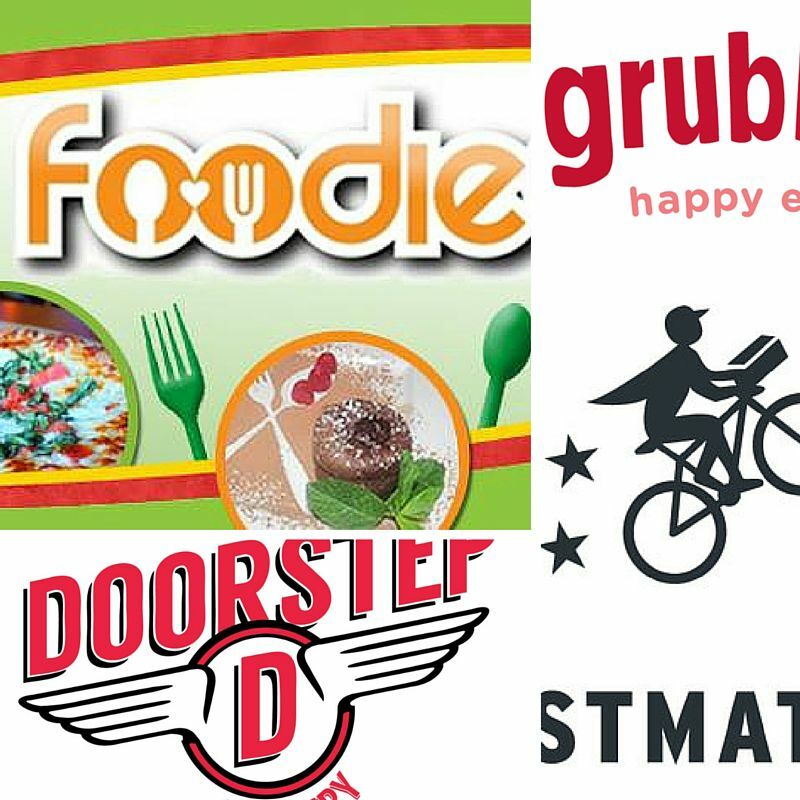 GrubHub has a list of about 50 restaurants in Charlotte that they will deliver food from, with Charlotte standards Pita Pit, Buca Di Beppo, and Libretto's Pizzeria highlighting the offerings. GrubHub has a huge variety of international options like Jasmine Grill, Great Wok, Tulips Indian Cuisie, Ho Ho Cherry House, and China Fun. For a problem with a GrubHub order in Charlotte, call 877-585-1085. If you think you've got what it takes to deliver food for GrubHub in Charlotte, you can find their application page here. Like Foodie Call, Take Home Delivery is a Charlotte based company. They're newer to the game, so their options are a little smaller than some of the others. But if they're got the restaurant you're looking for, you can usually expect to get your food a little more quickly. With Take Home Delivery, you can find Charlotte favorites Dilworth Neighborhood Grille, Sonny's BBQ, Crown Point Restaurant, Buca Di Beppo, Tyon House Family Restaurant, and Maria Bonita. If you're looking for a restaurant in Charlotte that does their own delivery, there are several ways to find out which ones are in your area. Yelp.com has a user updated list of restaurants that deliver in Charlotte, and it's usually pretty reliable. Expect to find standard options like Chinese food and pizza, but also options for burritos, barbecue, and soul food. Of course, here at About Charlotte, you'll also find several great lists for Charlotte restaurants like The Best Restaurants With A View in Uptown Charlotte, the Best Chinese Restaurants in Charlotte, The Best Restaurants in the Queen City that Use Local Ingredients, and even the Best Hot Dog in Charlotte. If there's one thing Charlotte is known for though, it's barbecue, and if you want to find Charlotte's best, you can see our list here. Charlotte Parent magazine recently compiled a list of services that will send fresh food to your door in Charlotte. Also, it's not exactly delivery, but be sure to check out Thrillist's list of Charlotte's top food trucks. You may not need delivery when you see one of these rolling up across the street!